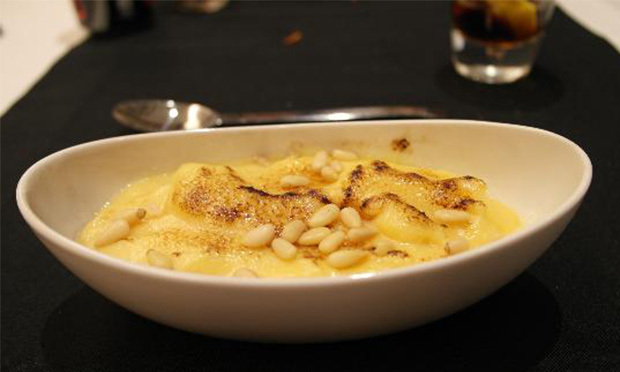 The lightness of the cream with the sweetness of the pine nuts make this dish an easy meal to prepare. 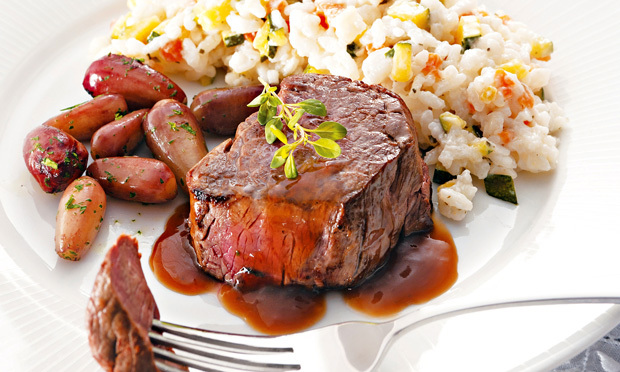 With a simple sauté and seasoned to taste will make this an unforgettable dish. 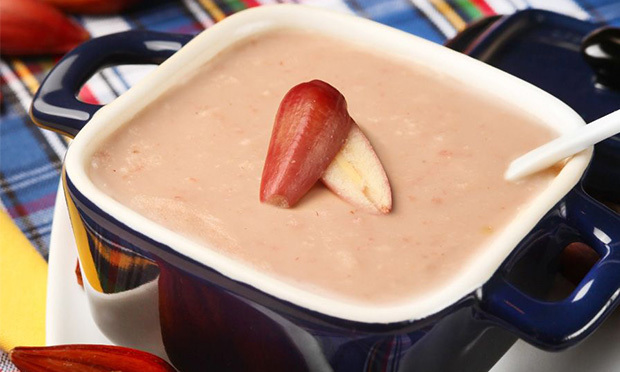 A delicious side dish ideal to every meal, the perfect match of sweet and salty. Let yourself be tempted by the tender taste of a grilled filet mignon medallion, accompanied by a delicious pine nuts sauce. Healthy with an Italian twist. 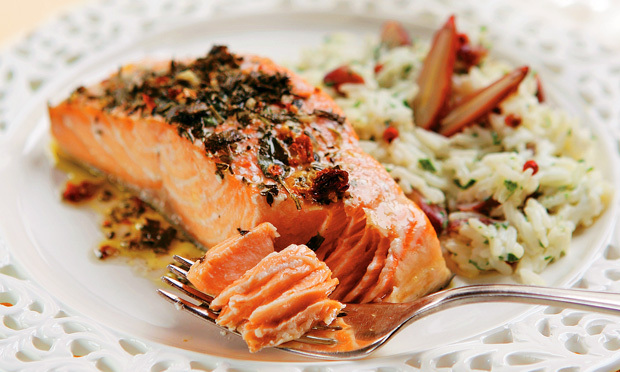 The dish consists of two salmon fillets carefully seasoned and roasted in the oven. Accompanied with the risotto. The perfect accompaniment! It starts with a sauté to refine the flavours and adds the rice with water, letting it cook until gets tender. Sliced cod, cooked and chipped, seared in the oven, wrapped in an onion stew and white sauce with French fries, pine nuts and raisins. Typical dish of the Middle East. 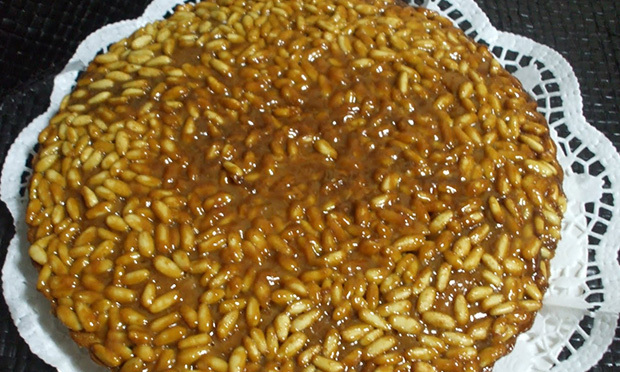 Boil the pine nuts and made prepare a homogeneous dough. Add the crushed pine nuts and all the ingredients. Pesto is a cold sauce, symbol of Genoa and the whole region of Liguria, whose preparation is very simple if you follow this recipe with a bit of attention. 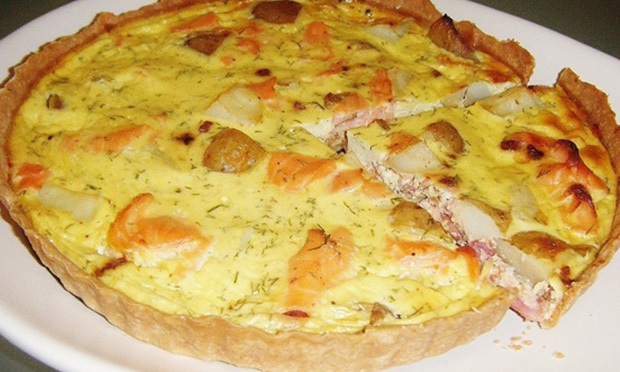 A delicious pastry crust pie stuffed with salmon and pine nuts baked until it’s gilded. Serve hot, warm or cold. Tasty and creamy! It’s a soup with the typical flavour of the pine nut, becoming unique and that can bring a delightful touch to any meal. Prepare the dough with all the ingredients and bake. Later, pour the delicious sauce over it, leaving it browning. A dessert for the whole family. 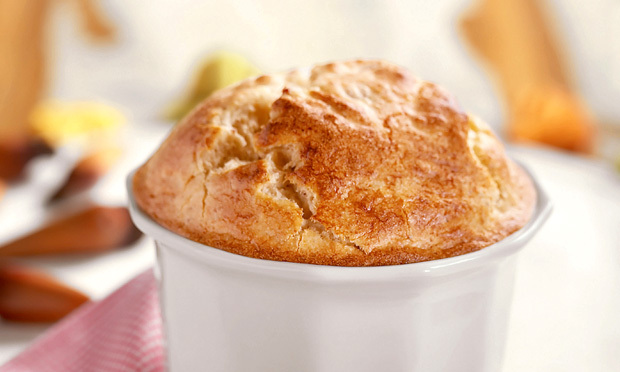 It is a typical dessert made of eggs, sugar and vanilla. In the end, it’s covered with sugar and burnt to get a caramelized look. 2 - Season with salt and pepper and drizzle with the chicken broth and let it cook for 10 minutes. 3 - Add the pine nuts and drizzle with the cream. 1 - Heat the butter in the frying pan, leaving the finely chopped onion wilting and browning. Add the boiled, processed and sliced pine nuts, letting them sautéing. Season to taste with salt, black pepper, parsley and minced chives. Leave it to cool. 2 - Using an electric mixer, beat the milk, wheat flour and egg yolks. Slowly add to the already sautéed pine nuts, adding the grated cheese. Join the four softly beaten egg whites. Put everything on the greased bakeware and bake in medium heat. Serve immediately. 1 - Season the meat with salt and pepper. Heat the grill and add the olive oil. Put the filets and sear them on both sides. Reserve. 2 - In a saucepan, heat the butter and add the pine nuts, salt and pepper. Stir well and when it’s hot, sprinkle the chopped parsley. Serve with the medallions. 1 - For the salmon – On a serving dish, place the salmon skin-side down and sprinkle the remaining ingredients. Cover and refrigerate for at least 30 minutes. Half an hour before serving, distribute the seasoned fillets in an ovenproof baking dish platter lined with aluminium foil. Cover with the same paper and bake in a preheated oven at medium temperature for 20 minutes or until it’s roasted. No need to flip the fillets. 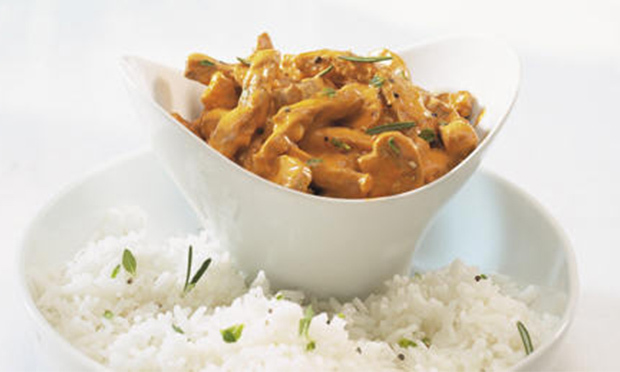 2 - For the risotto – Stir the milk cream with the corn starch and cook over low heat. Combine all ingredients, except for the pepper, stir and remove from heat when getting hot. Keep over a pan of boiling water while preparing the fish. Sprinkle pepper before serving. 1 - Wash the rice with tap water, drain and reserve. In a saucepan, heat the oil and add the rice. Sauté it until it begins to stick to the bottom of the pot. Add the chopped pine nuts, sauté for 1 minute more and season with salt. Add hot water, stir well and cover the pan. Reduce the heat and cook until the rice is tender. If necessary, add more hot water. Turn off the heat and serve immediately. 1 - Start by washing and peeling the potatoes, dry them and slice them into matchsticks. Later fry them but only until they are boiled and drain them on absorbent paper. Then cook the cod for 10 minutes over low heat. Once cooked, remove the skin and fishbones and sliced it. 2 - Meanwhile, peel the onions and thinly slice them. Wash, dry and chop the parsley. Squeeze the lemon and add the juice to the egg yolks and whisk them. 3 - Heat the milk. 4 - In a pot, blend the olive oil, the lard, the onions and the parsley and sauté them. When they start to brown, add the cod slices and the flour. Stir continuously until it’s well involved. Add the hot milk and keep stirring until it turns into a thick cream. Season with salt, pepper and nutmeg. Remove from heat and stir the beaten egg yolks with the lemon juice to this mixture. Bring back to heat, always stirring for 1 minute. 5 - Pour a tablespoon of olive oil in the bottom of a baking tray and cover it with a layer of French fries and a layer of cooked cod. Sprinkle with pine nuts and seedless raisins. Repeat the layers until the baking tray is full. Finally, sprinkle with breadcrumbs and bake in heated oven at 190 ºC to sear. Serve immediately. 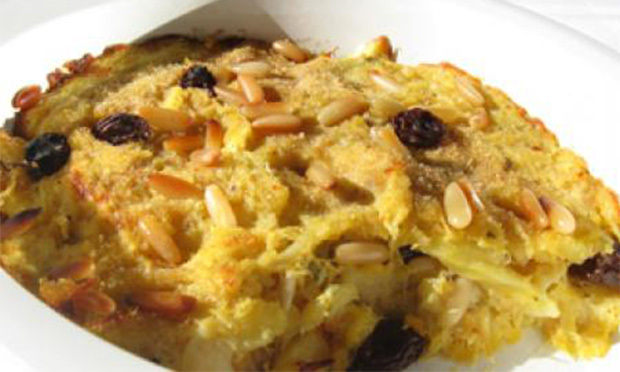 The base of this dish is cod with cream, but without the cream and with the pine nuts and raisins which makes it very nice and tasty. It can be served as a Christmas dish. In the water where the cod was cooked put a bay leaf and a garlic clove. 1 - Soak the bulgur in plenty of water. If in a hurry, soak the wheat and then take it to the microwave for 10 minutes. 2 – Cook the pine nuts in a pressure cooker until it gets very soft. Peel them and grind in a blender in the pulse function so they get totally crumbled. 3 – While the pine nuts are boiling, cut the onion into cubes. Reserve. 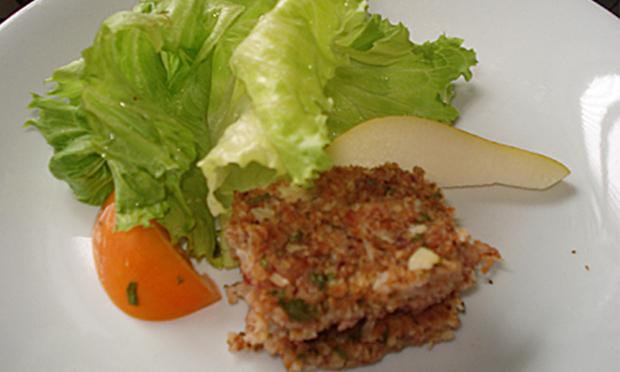 4 – Wash the parsley and finely mince it. When the pine nuts are cooked and grinded, drain the bulgur and squeeze it well with your hands. Combine all the ingredients: pine nuts, parsley, onion, bulgur, olive oil, Cottage cheese, salt and tabasco pepper sauce. Mix everything well until it turns into a homogenous dough. 5 – Grease a small springform pan with olive oil and place the kibbeh dough. Make cuts of 3 cm2 and place small pieces of butter to well hydrate the dough while baking. The kibbeh should bake just to gild and cook the onion. Then, roast it without drying in an oven at 180 ºC. Serve it either hot or cold. 1 - To start, it is important to wash the basils leaves, not straight in the water, but with a wet cloth. This process is very important in order to get a wonderful pesto sauce, because the basil leaves must be dry and cannot be wrinkled. Place all ingredients in a blender, except for the cheese. Beat everything slowly until the mixture turns into a creamy and liquid sauce. At this point, add the cheese and stir well until everything is well blended. Keep the pesto in the refrigerator for 2-3 days in an airtight container, being careful to cover it with a layer of extra-virgin olive oil. Pesto, apart from being an excellent sauce for pasta and lasagna, can also be used to prepare some fried dishes as well as an accompaniment for meat and fish dishes. Before proceeding with the preparation of the pesto, it’s better to place the blades (preferably plastic ones) and the blender jar in the refrigerator for a few hours, to prevent the basil leaves to spoil while blending. 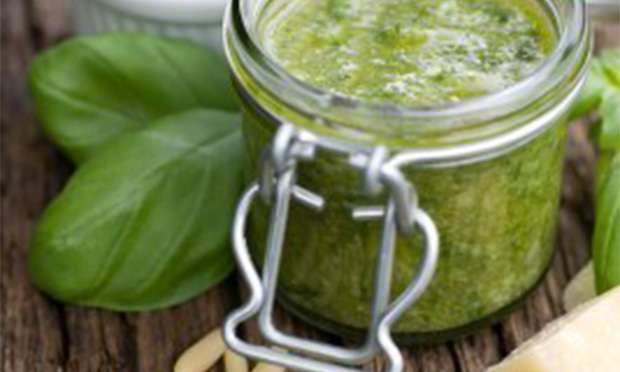 The pesto can also be frozen in small bottles and later defrost in the refrigerator or at room temperature. This sauce goes very well with medium bodied white wine. To accompany the significant flavour of pesto, we recommend a more pungent and fruity wine such as Vermentino from Liguria itself which, due to its tradition and elegance has always accompanied this dish. 1 - Adjust the oven thermostat to 180 ºC. Add butter and flour in order to shape it a bit, roll the dough and prick with a fork. 2 - Cover the dried beans to prevent them to swell and cook them for 10 minutes. 3 - Wash the spinach, drain and let them dry on a paper towel and melt them in a large pan with 20 g butter. 4 - Remove the skin of the salmon as well as the fishbones with tweezers, cook it in a pan, 2 minutes in each side. 5 - In a bowl, beat the eggs with milk, cream, nutmeg, salt and pepper. 6 - Drain the spinach thoroughly in a colander. Stretch it well with the back of a skimmer, then spread them in the dough. 7 - Cut the salmon into pieces, remove any edges that would have remained and coarsely crumble the egg mixture. 8 - Pour the mixture over a bed of spinach and sprinkle with pine nuts. 9 - Bake it for 25 minutes. 10 - Monitor the cooking, and when the top is lightly browned, turn off the oven and let rest for 5 minutes before serving. Enjoy it hot, warm or cold. 1 - Put the pine nuts, onion and garlic in a blender, add the water and blend everything. 2 - Put the already crushed ingredients with the broth in a saucepan adding some lemon drops, with the remaining water, stirring continuously. If the juice gets too think, add more water. 1 - For the tart dough, batter all the ingredients and bake at 180 ºC for about 10-15 minutes. While the tart is baking, prepare the cream. In a frying pan, combine all the ingredients for the cream and let them boil for about 10 minutes. In the meantime, take the tart from the oven and pour the compound sauce over it, bake again for 5 minutes just to gild the tart. 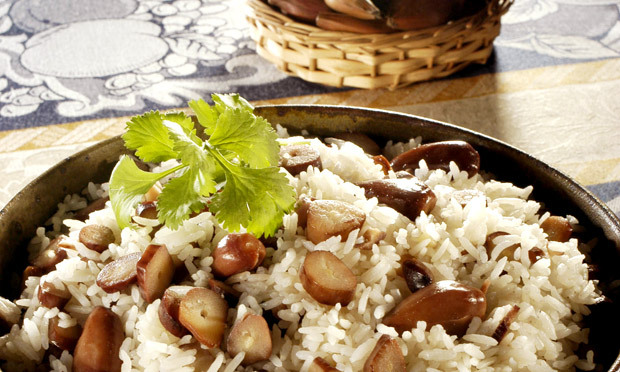 1 - Separe as gemas da clara dos ovos. 2 - Copa cortado em tiras finas. 3 - Toste as fatias de pão e corte cada um em quatro triângulos. 4 - Bata as gemas até que oeligufs & lixívia, adicione o mascarpone e adicione metade da tiras de copa, queijo parmesão ralado e metade dos pinhões. Sal e pimenta. Misture delicadamente as claras batidas em neve e oeligufs. 5 - Despeje a mistura em um copo ou prato, com triângulos de pão nas bordas, em seguida, a mistura de mascarpone. Coloque no frio por várias horas, de preferência de 12 a 24 horas. 6 - Sirva com pinhões polvilhado sobre o resto da copa em tiras e cebolinha. 1 - Reserve some milk and dissolve the flour in it. Whisk the egg yolks with the sugar until you get a whitish cream. 2 - Put the remaining milk in a pot with the lemon peel, a pinch of salt, 2-3 vanilla drops and the cinnamon stick. And the mix of egg yolks and sugar and stir. Finally, add the flour previously dissolved in the milk and stir again. 3 - Bring to boil and simmer, while stirring, not to gain lumps. After boiling, keep it heating for about 3 minutes and remove. Remove the lemon peel and the cinnamon stick. Join 50 g of peeled pine nuts and pour it into a serving dish to cool off. 4 - When cold, cover with sugar and burn with a hot iron until it’s caramelized.